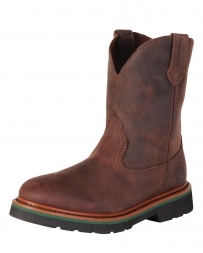 These John Deere® Johnny Popper boots are ready to be worn out on the farm or ranch. They are made of gaucho nutty mule leather and are unlined with a steel shank, Goodyear Welt Construction and non-marking rubber outsole. The shaft height is 6 1/2" and is based on a size 9 boot. Imported.